We begin episode two in front of the Wheeler house where rain pours down. Inside, a frightened Eleven is interrogated by Mike, Dustin, and Lucas. Mike calms everyone down until he offers clothing to the silent Eleven and she starts changing in front of the boys, freaking them out. Mike helpfully directs her to the bathroom where she lets him crack the door but not close it, speaking her first lines. 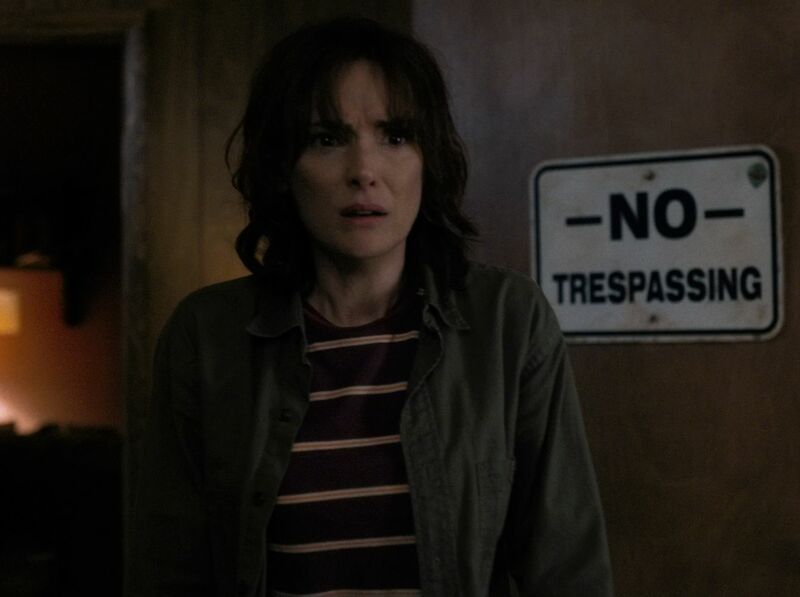 The boys discuss Eleven while she changes, Lucas taking on an antagonistic view of her while Dustin can't get over her attempted public changing. Mike convinces his friends to keep Eleven's existence quiet so they don't get in trouble with their parents with a plan to have her approach his mom the next morning. After his friends leave, Mike helps Eleven settle in for the night, learning her name when she shows him her tattoo. He shortens her name to El and leaves her for the night, hidden in his basement where she cries. We're back with the Joyce and Jonathan Byers, where an electrician is working on their powerline. Jonathan has made breakfast, but Joyce refuses, still too worried about Will and all that needs doing. Someone knocks on the door. It's Sheriff Hopper, bringing a report on the lack of success in the search for Will. Hopper checks Joyce's fried phone from last week, chalking the incident up to a storm. Joyce insists it was Will on the phone, but Hopper attributes the call to a prank. Joyce maintains that she knows her son's breathing, just as he would know his own daughter's. Hopper decides to go check out Lonnie, Joyce's ex-husband. Mike makes Eggos, sneaking some into his pockets. His family sits at breakfast. Nancy gives Mike side-eye for his sloppy waffle eating, telling him to slow down. They have a short exchange where Mike references her secret study session with Steve and end up kicking each other's chair until their mom stops them. Clueless parents are clueless. Eleven plays with Mike's walkie-talkie, making Mike comment on its weak signal before presenting her with a hidden waffle, which she tucks into. He instructs her of the plan for her to come to the front door and say she needs hope. She shuts him down with a decisive "No." Mike deduces that Eleven is in trouble with bad people. When prompted to answer Mike's suspicion, Eleven raises her fingers in a gun symbol to her head and then to Mike's. Message received. Mike leaves. Dr. Brenner, the creepy doctor from Hawkin's Laboratory, walks down a hallway discussing the former evening's events and the missing Will. Next thing we know, he's listening to a recording of Joyce insisting Will was on the phone. The search in the woods continues for Will. The cops discuss Joyce's mental state, but Hopper shuts them down. At the high school, Steve interrupts Barb and Nancy's hallway study session to invite them to a small party at his house. They comment on Jonathan Byers hanging up missing posters, and one of the teens suggests he killed his brother. Nancy tries to reassure Jonathan. In the middle school, Lucas and Dustin discuss Mike's absence from school and how weird they think Eleven is. Lucas points out they need to get back to their mission to find Will. Mike bikes down the street. Not sure what he was doing because in the next moment he's offering El a drink. She finds his family pictures more interesting than his "22-inch TV," especially Nancy's, which she dubs "pretty." Mike then helps her discover his dad's Lazy Boy. Jonathan drives down the street. "Should I Stay or Should I Go" by The Clash plays and takes him back to a memory with Will where he showed him the song and gave him advice about not liking things just because others wanted him to. What a good brother. Will decides he truly likes the song. Joyce buys a phone to replace the fried one at her workplace. She requests (and gets) an advance to cover things while she's out of work. A shady mustachioed dude knocks on the Byers's door. No one answers, so Brenner and his protection suit-clad entourage investigate the land, including the shed where Will disappeared. They find some interesting goo in the shed. Mike shows off his room and toys to El, including the force-using Yoda who can move things with his mind. El notices a picture of the boys, and she points out Will, causing Mike to question if she saw him. Wheeler Mom arrives with toddler Holly, so Mike tries to sneak El downstairs but is forced to hide her in the closet in his room. Mike promises not to tell anyone about El, explaining that a promise is something you can never break. He runs to answer his mom's call while El experiences claustrophobia in the closet, returning to a past memory where she was dragged down a hall and locked in a small room. Mike has a pow-wow with his mom, claiming he didn't feel good to explain his scholarly absence. His mom chalks it up to him having a hard time with Will's disappearance and reassures him that he can tell her anything. A bump is heard from upstairs. Mike finds Eleven scrunched up in the closet. She nods and says, "Promise," when he asks if she is okay. Joyce becomes a sentry with her new phone, waiting and hoping her son will call. Hopper and one of his men discuss the likelihood of a survivor's long fall into a river when he receives a call from the police station reporting a call from Benny's, AKA the diner from the first episode. Hopper and his cops check out Benny's body. The bad guys left a gun in Benny's hand to make it appear a suicide. One cop laments the fact that there are so many strange things happening (hehe), while Hopper reflects on the fact that in the past he only worried about strangers, not his friends. Jonathan arrives at his dad's house where he searches for Will but doesn't find him. Later, he searches his dad's trunk and criticizes his father for the lack of worry he shows about Will, but his dad blames his mom instead. Meanwhile, Mike tells Lucas and Dustin about Eleven recognizing Will and about the bad people after her. Lucas interrogates Eleven, but she doesn't answer. The boys get into an argument about the danger surrounding Eleven and whether or not they should tell Mike's mom. When Lucas attempts to leave the room to do just that, Eleven uses her mind to slam the door shut. Twice. Then she locks it and tells him, "No." That's right. At the police station, Benny's friend tells Hopper that Benny was excited about a fishing trip they were going on, making suicide unlikely. He also mentions being at the diner when Eleven was there, though he thinks she was a boy. Hopper surmises that the kid could be Will with a haircut. Nancy convinces Barb to attend the secret party at Steve's with her. Wheeler family dinner includes Mike and Lucas. All the boys eat lightly. Nancy tells her mom she wants to go to a school event in support of Will, though we all know where she's really going. Mrs. Wheeler suggests Nancy take the boys with her. They emphatically disagree, much to her surprise. Eleven sneaks down the stairs in the background, causing reactions in the boys to keep Mrs. Wheeler from noticing. Holly steals the scene, sinking into her seat as if she can't stand this whole situation. The search continues for Will, and the cops wonder if the shaved kid really was Will. Someone finds a drain with a piece of fabric attached to it. Could Will have crawled through? Apparently he's good at hiding, so maybe. Hopper finds the fence in front of Hawkin's Lab. The boys bring El dinner as she fiddles with Mike's walkie-talkie. When Lucas tells her they were trying to find their friend, Will, Eleven doesn't understand the word "friend," so they explain how important friends are, emphasizing the importance of spit. Nancy and Barb continue toward the party that screams bad idea so Nancy can change her shirt, and she also insists that they can't park in the driveway. Barb tries to warn Nancy, but she typically insists on going. When they arrive, Steve invites them in. Hopper is in bed with some lady I don't think we've seen before. He talks about being cursed and the last town suicide. Things don't seem to end well when he insists on staying outside while his lady friend returns to bed. Mike, Dustin, and Lucas are trying to figure out if El knows where Will is. She picks up their board game and flips it over, choosing a figure to represent Will. She tells them Will is hiding. After an inquiry into who he's hiding from, she produces the scary Demogorgon figurine from the first episode, slamming it into the center of the board. Well, then. Jonathan drives into the woods with a camera. He takes pictures, obviously hoping to find some evidence to help his brother. Instead, he hears a scream, but when he investigates it's only Carol, one of Steve's friends, being teased by her boyfriend. Steve and Nancy flirt over beer cans and cutting them with knives. Nancy drinks an entire can, urged on by the guys. She invites Barb to a can, but Barb doesn't want to. After Nancy pushes her, she tries to follow their lead but cuts her hand open instead. Upset and bleeding, she heads to the bathroom. The boys push the girls into the pool before joining them, all while Jonathan takes photos. Back with Joyce, the phone finally rings. Weird noises. She calls out, asking for Will. She hears his voice calling her. The phone zaps again. Another phone, ruined. Joyce sobs, losing her connection to Will again. A light in the room flickers to life, and a path of lights lead to Jonathan's room where the radio turns on, playing "Should I Stay or Should I Go." Officially freaked out here. The lamp flickers, making Joyce realize it is Will communicating somehow. Suddenly, the power in the room goes out. The wall begins to expand as if something is trying to come out of it. Joyce runs out and tries to start the car. The lights return in the house along with the same song. Joyce returns, confident that it is Will. Post-swim, the annoying teens are now wet and cold. Steve offers Nancy dry clothes, but Barb catches her on the way up the stairs, questioning her actions. Nancy tells Barb to go on home and that she's fine. Jonathan continues taking photos of Nancy through Steve's window. Steve brings Nancy clothes. She requests privacy, so he turns around, but then she says his name and starts to undress in front of him. (Mixed signals???) They kiss, and Jonathan takes more pictures. That's weird. Dejected, Barb sits with her feet in the pool. Her cut drips blood into the water and the lights flicker off. A strange/creepy noise is heard, she looks up, and we see just a flash of monster. Oh, and I'm screaming. And Barb is gone. Jonathan is in the bushes, but he's so distracted by Nancy and Steve's making out (ahem) that he somehow misses the scary creature with Barb. Dude, really? Finally, he leaves like a sensible young man. Steve and Nancy kiss and go to the next level. Ugh, whyyyy. The lights flicker back on at the pool. The end of the episode. 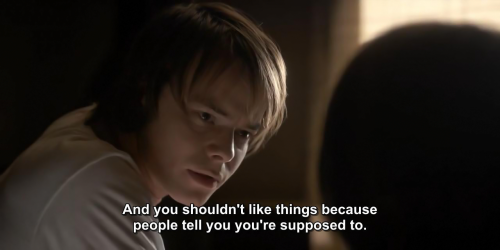 Will Byers, still. We did hear his voice, though, so hopefully he'll be okay. Barb. She disappeared at the end, so no knowing here. What was your favorite moment from episode 2? If you haven't seen Stranger Things, what are you waiting for?